The 2015 Baseball Factory All-America Pre-Season Rookie Tournament featured 74 players from 20 states. Players were divided into 6 teams, with each team scheduled for workouts followed by a single game on day one, and then a doubleheader on day two. Our scouts, along with the others in attendance, were treated to impressive displays from this group of players. While we cannot honor everyone that attended, we did want to highlight a few players that stood out from the class of 2018. Below is an alphabetical listing of the 2015 Baseball Factory All-America Pre-Season Rookie Tournament. Cortez is a strong physical presence behind the plate at 6-foot and 210 pounds. He showed that he is an advanced player in all elements of his game. Behind the dish, he showed soft hands and the ability to deaden the ball when blocking. He recorded the top pop time out of all the catchers at 2.10. Offensively, Julio has an explosive bat with excellent rhythm to his swing. He displayed the ability to drive the ball to all fields with power. Julio is an impact player and a prospect that should continue to get quite a bit of attention in the years to come. Jordan is an athletic SS/RHP that has natural instincts on the diamond. His defensive actions are fluid and smooth, such that he looks extremely comfortable making plays to his right and left. On the mound, Jordan throws a heavy fastball with top end velocity of 84 mph this outing. His ability to get ahead of hitters and throw strikes at this age allows him to be a successful pitcher. Offensively, Groshans generates bat speed with ease and keeps his barrel level through the zone. He displayed a combination of hitting ability and raw power that you don’t see very often at this age group. With his ability to hit he currently projects best as a position player at the next level and should be a special player to watch. Jose is a talented athlete that can really swing the bat. A left-handed hitter with advanced raw power for his age, Jose shows the potential to be a special offensive player at the next level. This summer he displayed his ability to drive the ball in games at Pirate City with balls that reached 375 feet with ease. Defensively (listed as a primary catcher) Jose shows the ability to come out from behind the plate and play both corner infield positions. His strength and smooth swing will surely be a thing to watch in the upcoming years as he continues to mature. Standing at 6-foot-3 and 200 pounds, Dalton fits the mold of a big and physical power pitcher. He recorded the top velocity in Auburndale, cracking the mitt at 88 mph and comfortably sitting between 83-85 mph during his outing. His tall frame and long arms can be an intimidating presence at this young of an age. Dalton showed an effective three-pitch mix with slight tail to his fastball and an 11-5 breaking ball. Although early on in his outing he struggled to locate, he showed the ability to gain control and settle in during the later innings. Dalton has a bright future and should have college coaches’ attention in the near future. One of the most well-rounded players at the event, Dillon showed a special tool set in all areas of his game. Raw arm strength is currently one of his top tools, as evidenced by the good backspin and accuracy on his throws from the outfield. He will only continue to add value to his overall defensive ability as he improves on his first step reaction in the outfield. Offensively Lifrieri showed a very patient approach and quiet swing. Good balance and loose actions in his hands allow for a compact line-drive stroke. His long limbs and command of two pitches gives him value on the mound, and makings him a potential two-way prospect. Dillon has really shined over the last couple years and should be an impact player to follow through high school. A left-handed pitcher who resembles Cliff Lee on the mound, Marsh demonstrated the ability to change speeds and locate effectively. A true pitcher, Dillon showed a three-pitch mix with good movement to his fastball, which sat between 79-81 mph. More impressive was his ability to locate and have complete control of his secondary pitches. His curveball showed tight spin and late break, while his changeup had fading sink action. With good awareness and tempo on the mound for such a young arm, Dillon has the composure to compete at a high level. 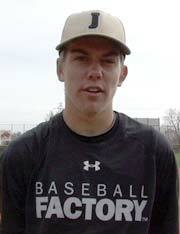 With a strong frame at 6-foot-2 and 185 pounds, Connor pounded the zone with an 83-86 mph fastball. He displayed good mound presence and an awareness of how to control a game. His ability to locate his fastball to both edges made his 73-75 mph slider almost unhittable — as evidenced by the five strikeouts he recorded on that pitch alone during his outing. The combination of velocity, depth, feel and his ability to set it up makes for an advanced and extremely effective breaking ball. With three more years of high school remaining, its impressive to think that Noland still has room for growth as he continues to physically mature. One of the top natural athletes in Auburndale, Thomas plays the game with ease. Defensively, Alek is light on his feet with a smooth and clean transition on his exchange to throw. His routes to balls in the air are very sound — he showed excellent feel to work behind and through the baseball. A left-handed hitter, Thomas is an ideal top of the line-up hitter with an advanced approach and the ability to drive the ball to all fields. His instincts and quickness on the bases are so impressive for such a young player — it’s actually hard to believe that he is only a 2018 grad. With three more years of growth, Alek has all the making to be a special player at the next level. With excellent baseball IQ and leadership qualities, its no surprise that Treet finds himself playing behind the dish. Defensively, he displayed natural instincts with the ability to control the running game. Receiving skills were quiet and he showed a good feel for blocking balls in the dirt. What is even more impressive is that Williams is a switch-hitter who is more than capable of handling the bat from both sides of the plate. His actions are simple with a good feel for the barrel, and he showed the ability to drive the ball from gap to gap. His combination of attitude, physical skills and feel for the game make him an interesting prospect to follow down the road. With a long lean body standing on the mound at 6-foot-2 and 150 pounds, Wimbush displayed a loose arm that was exciting to watch. He featured a three-pitch mix highlighted by a fastball with good downhill plane up to 80 mph. From a slot nearly over the top, he spun a breaking ball with 12-to-6 action. He showed the ability to land the curve for strikes, and to bury it for swinging strikes. Ryan’s length and ability to locate makes him a pitcher with a high ceiling who has a bright future moving forward.